210 pages | 16 Color Illus. | 102 B/W Illus. 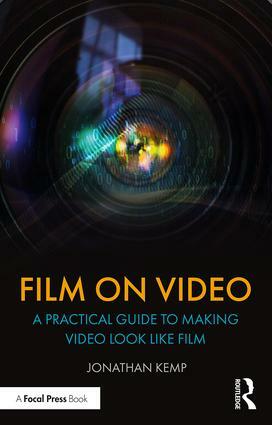 Film on Video: A Practical Guide to Making Video Look like Film is an accessible guide to making video captured on a camcorder, DSLR camera, smartphone, action camera or cinema camera look like it was shot on motion-picture celluloid film. Chapter by chapter, Jonathan Kemp introduces the reader to a key characteristic of celluloid film, explains the historical and practical reasons why it exists, before providing a simplified method for best replicating that characteristic on a digital camera. The book includes various practical exercises throughout that are designed to underline the takeaway principles of each chapter and features case studies on specific cameras including the Sony NX5 Camcorder, Canon 5D Mk IV, Canon 4000D, iPhone X, GoPro Hero 6, Blackmagic URSA Mini Pro 4.6K and Canon C200. Ideal for students studying film and media production and filmmaking newcomers who want to get up to speed quickly, this is an indispensable guide to how the numerous settings on a digital camera can be used to create footage that more closely resembles the film ‘look’.